AD’s strongest channel of information sharing and dissemination is done through its team of peer educators. 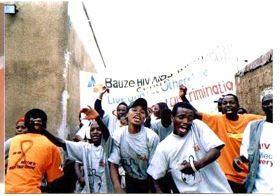 This is a group of young people who have come together to share information about HIV/AIDs, various life-skills, and other issues pertaining to youth. Africa Directions plans numerous workshops, training, and exchanges for these youth to give them the latest health information, link them with other organisations, and strengthen their facilitation skills. The group meets on a bi-weekly basis in order to refresh their knowledge, learn from specialised and/or successful people, and have fun with one another. The peer educators work hand-in-hand with Grassroots Soccer (an NGO which uses soccer to educate on HIV/AIDS) to develop interactive methodologies which they use when conducting outreaches in the community; they visit schools, churches, markets, and other popular places to sensitise their peers on HIV/AIDS prevention.